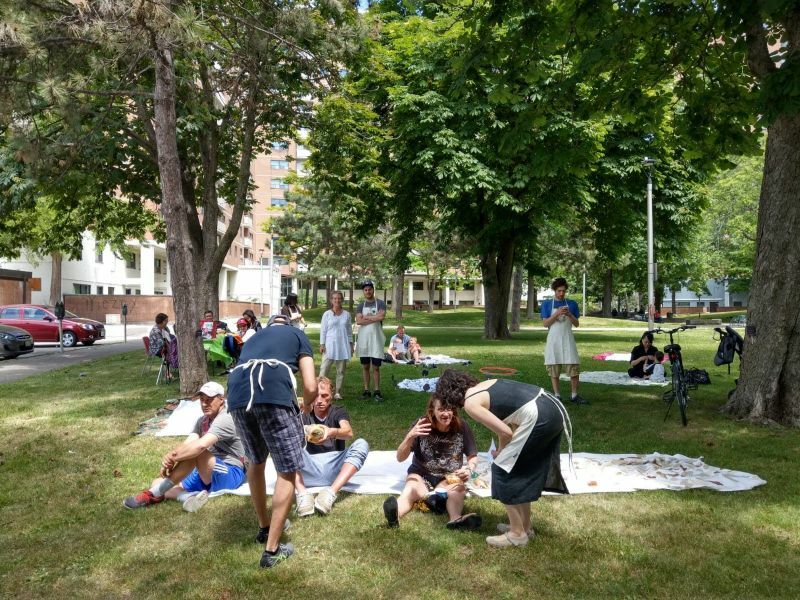 It's impossible to contain the AWE for what blossomed in Toronto this past Saturday at our first Karma Kitchen Picnic! Not only were guests well fed, we even had The Classy Wrecks, a live local band uplift our spirits all afternoon, an HeArt and bracelet making, and a hula hooping area for kids, impromptu scavenger hunt and plenty of smiles, hugs and gifts. What happened was simply MAGIC. 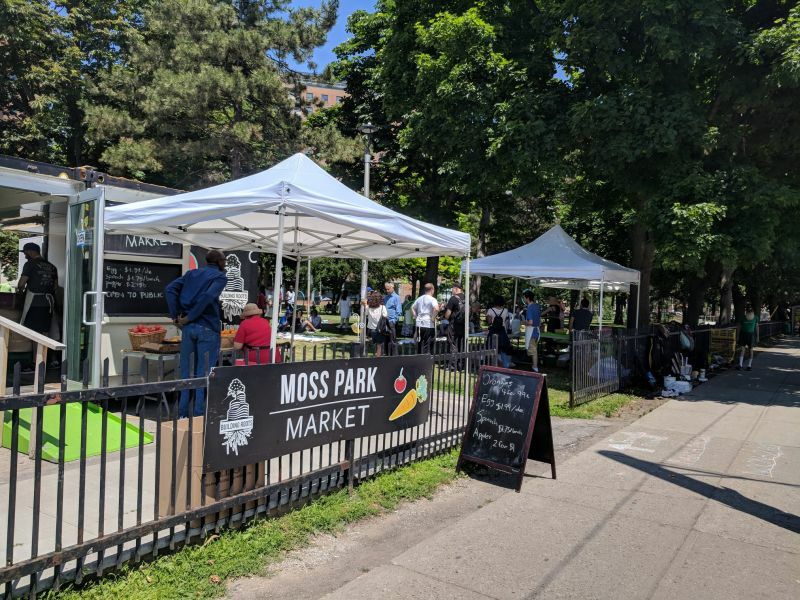 Moss Park is a really special neighbourhood in an increasingly gentrified and unaffordable Toronto. It's got a mix of long term residents, immigrants, refugees, and many homeless shelters and organizations. 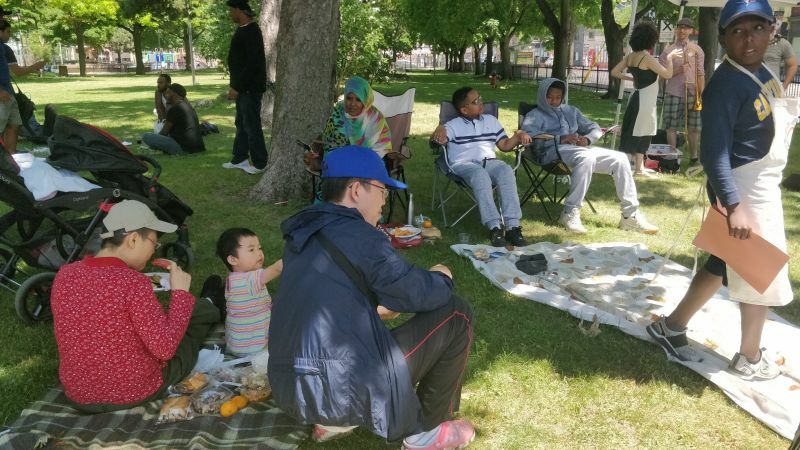 The fact that the picnic was held right on the park in Moss Park Apartments, a property of Toronto Community Housing and surrounded by neigbours such as myself in Regent Park, it made for the most diverse group of guests you could ever hope for. 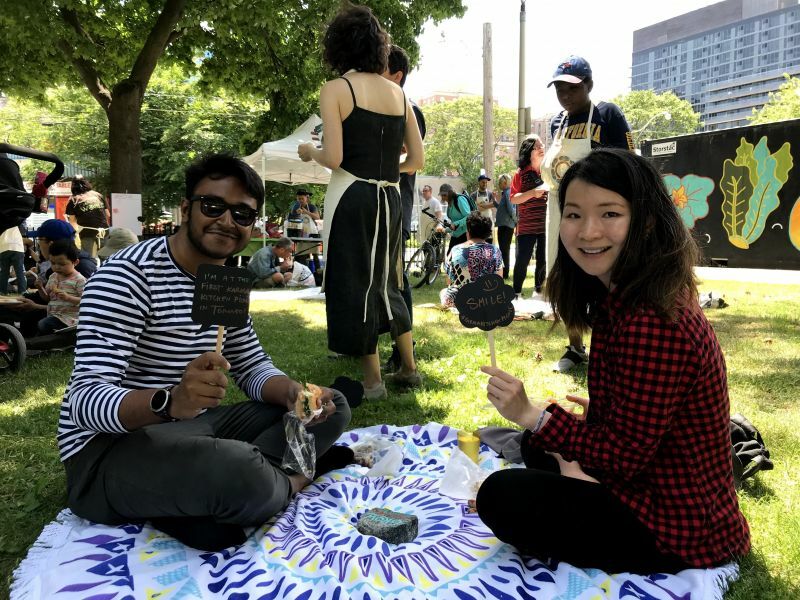 Friends and families of all backgrounds, socioeconomic status, health abilities, whether or not there was a roof above their heads or thousands of stars - we estimate that about 75+ people came out, connected through food and generosity. I'm pretty sure this was the first of it's kind in the neighbourhood....and certainly not the last. Our volunteers woke early and started with a beautiful opening circle of sharing about our memories of times we were grateful about the kindness we've received. 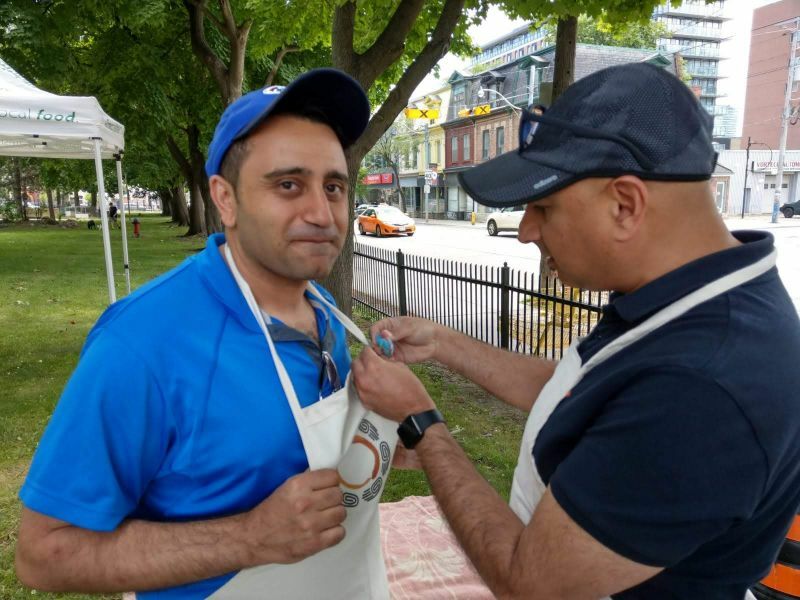 It was incredible to see the teamwork and comradery throughout the day from the food packaging, to setting up the park, to welcoming guests and making their day. 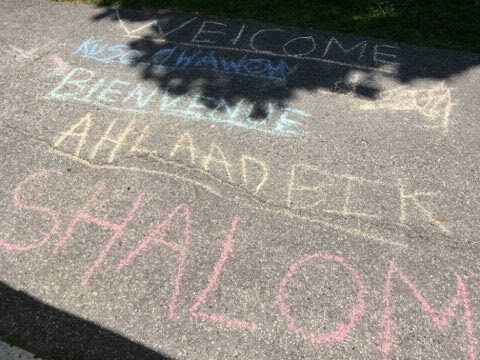 One of our volunteers, Nimo, who lives right beside the park, brought her son Adnaan who at first didn't know if he wanted to spend the day with boring adults and quickly changed his mind :) He blew us away with his creativity, first getting to work with sidewalk chalk to show people the way to the picnic. And then welcoming them in all languages he knew, even using a volunteer's phone to look up more languages. And patiently waited until everyone was done with the food to rally the kids together for a scavenger hunt. 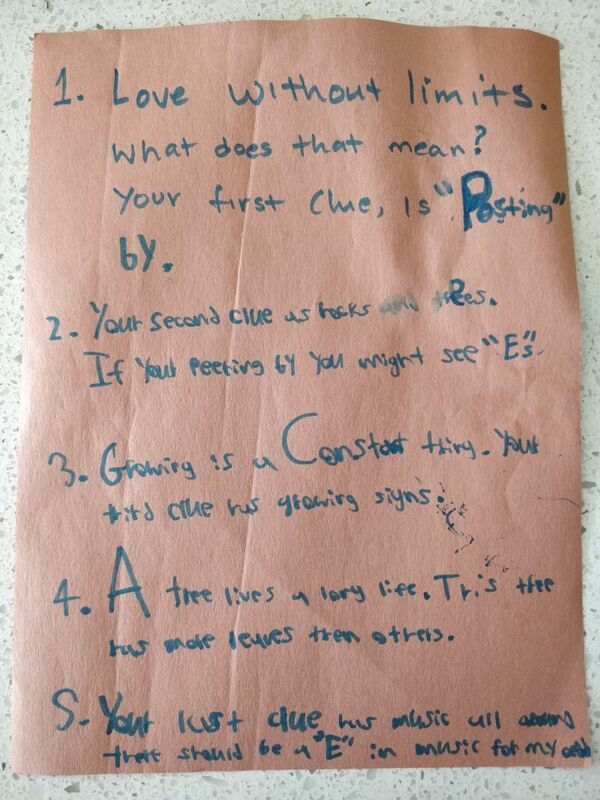 He made 5 letters and hid them around the park and created clues how to find each letter to spell the word... PEACE. #GoKindfulKids! 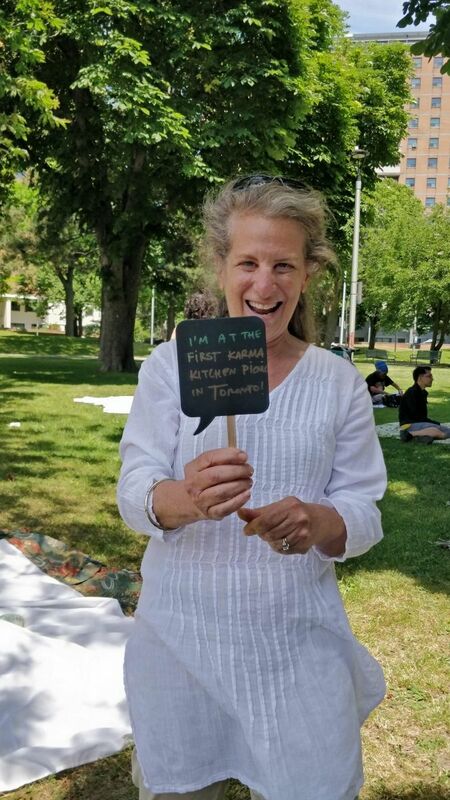 Adnaan, you are unanimously voted as the MVP volunteer for our first Karma Kitchen Picnic and definitely look forward to serving with you next month. 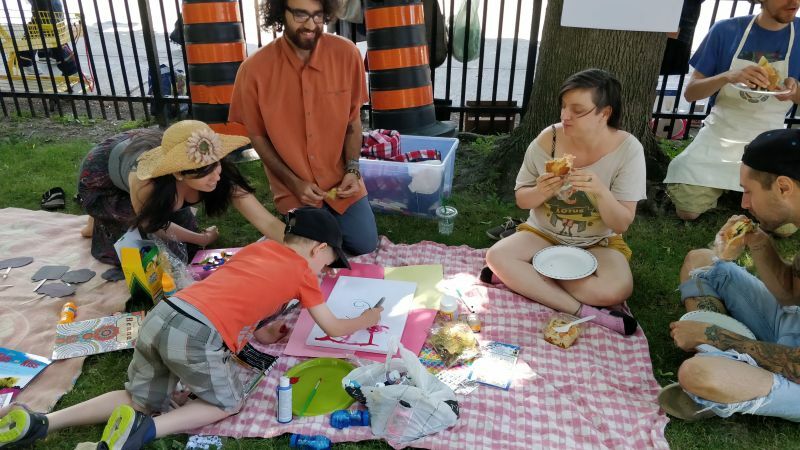 Moss Park has a large homeless population and in the park a block away, you can often see many well meaning volunteers give away food on any given day, especially in the summer. 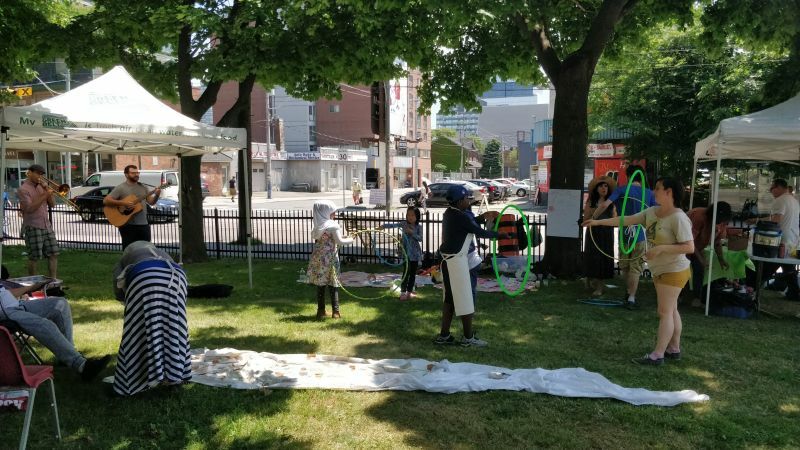 When folks spotted us setting up (we had been gifted some Tim Hortons coffee for the volunteers to start their day), they started to form lines thinking that we were going to hand out some coffee and fruits. You could see the surprise when we explained what we were doing and invited them instead to come have a seat, enjoy the music, grab a menu and be served as a gift. And then the lines turned blurry of who was giving and who was receiving. One lady pulled out $2 and said, is this okay to help this picnic happen again? This is all I have. A man (seen in the green shirt far right corner in photo) who regularly sets up a yard sale right outside also enjoyed our sandwiches. And then...he pulls out his earnings for the day...nickels and dimes and all and asked us to come back soon. 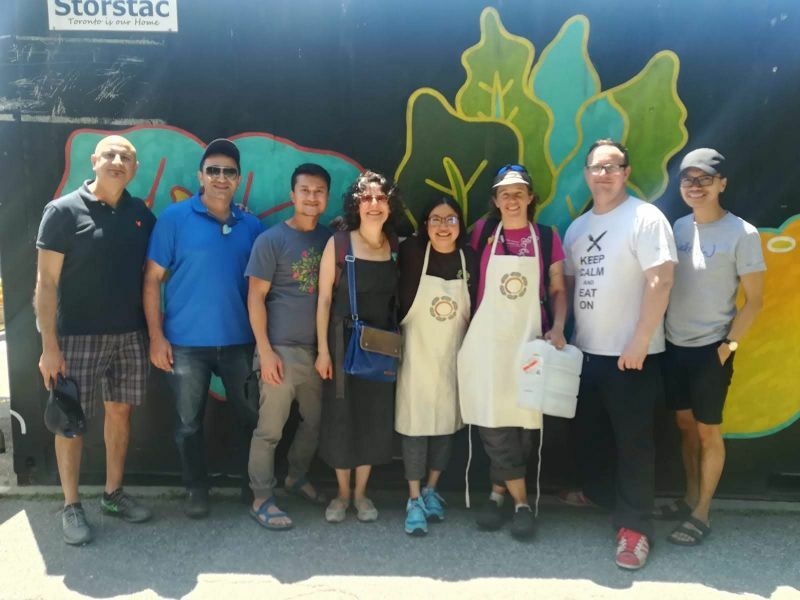 One of our volunteers reflected, "Wow, it was the ones who had the least who only ate what they needed and didn't want seconds...and the most generous of the day." Most of our "tables" were blankets on the ground. But we made sure to have a table for those that preferred to sit there. It was heartwarming to see guests interact. 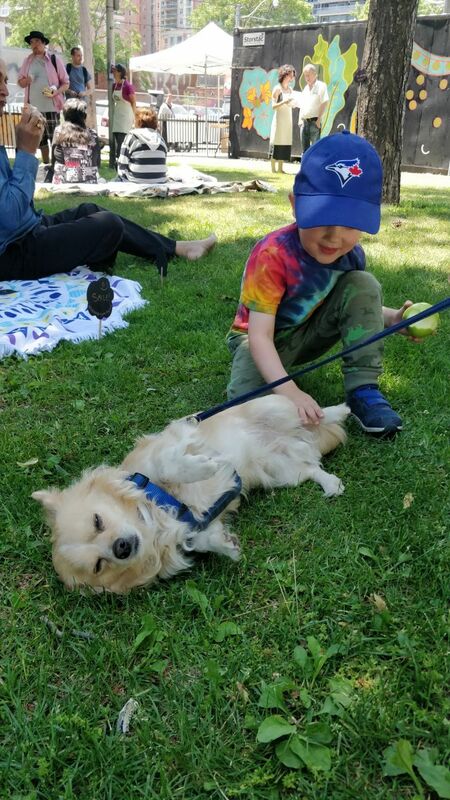 One woman in a wheelchair brought along a beautiful puppy that brought joy to many young guests, like Gabe. We were even blessed to have the brother of a Karma Kitchen London chef come dine and stay to volunteer and clean up. 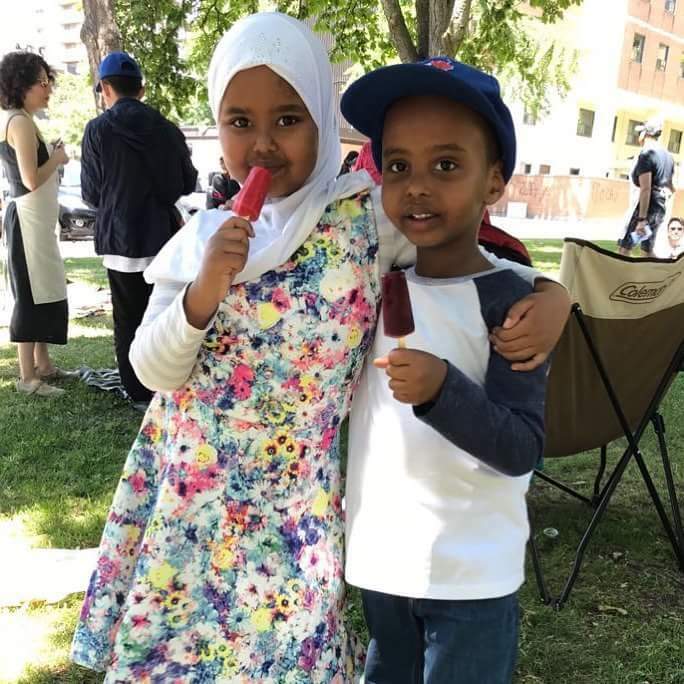 To see humans, especially right here in Moss Park, Toronto, connect through food and love was an incredibly priceless dream for all of us. Annnnnd we received so many compliments on the food and requests to come back tomorrow and all summer. Many new friends want to volunteer again and all our volunteers eagerly asked when the next one can be. 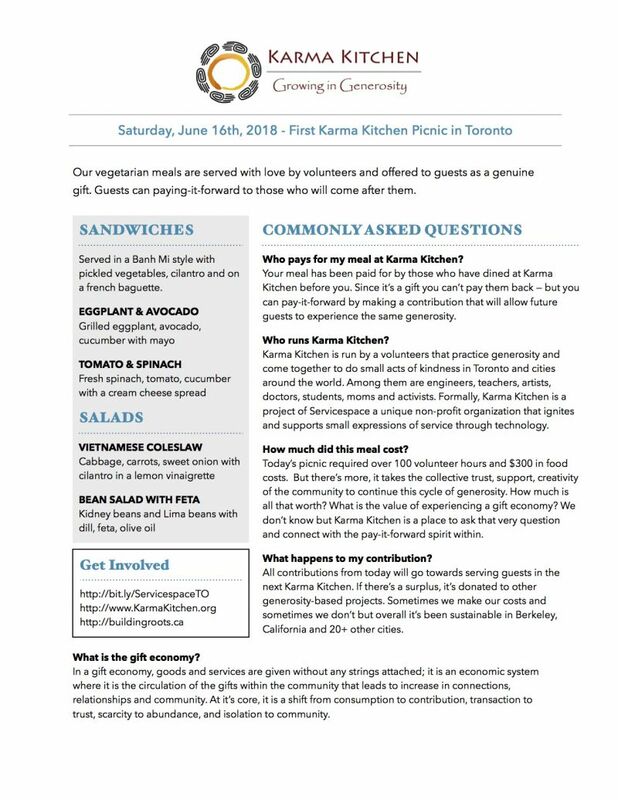 So YES...in true Karma Kitchen fashion, all the generosity and goodness generated this weekend really is rippling in all corners of the city...and the pay it forward model does indeed work. We are able to do this again next month! 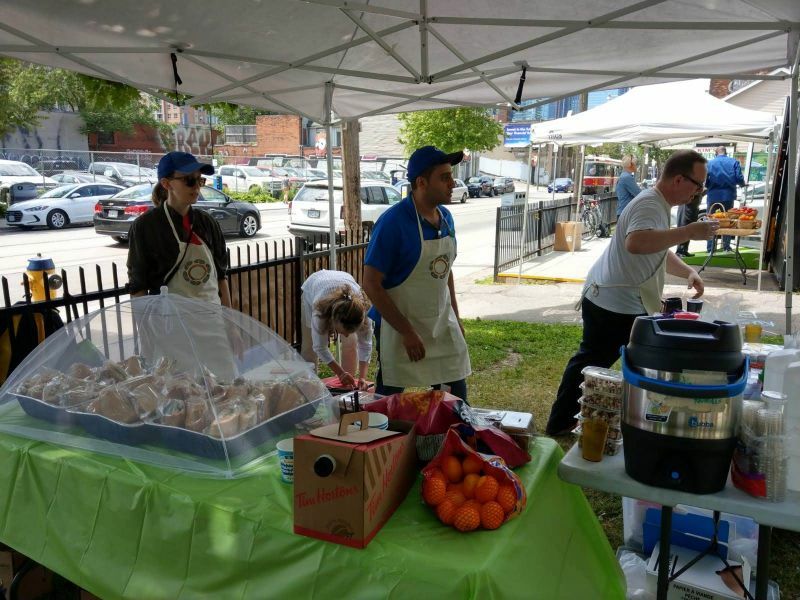 Fresh banh mi bread baked by the rockstars at Tung Hing Bakery and fresh ingredients from Moss Park Markets put together with great love will be back on the menu. Grateful for you all at Servicespace, Karma Kitchen, Awakin Circle, Awakin Toronto, Building Roots and all the invisible hands that created the conditions to make this all possible. 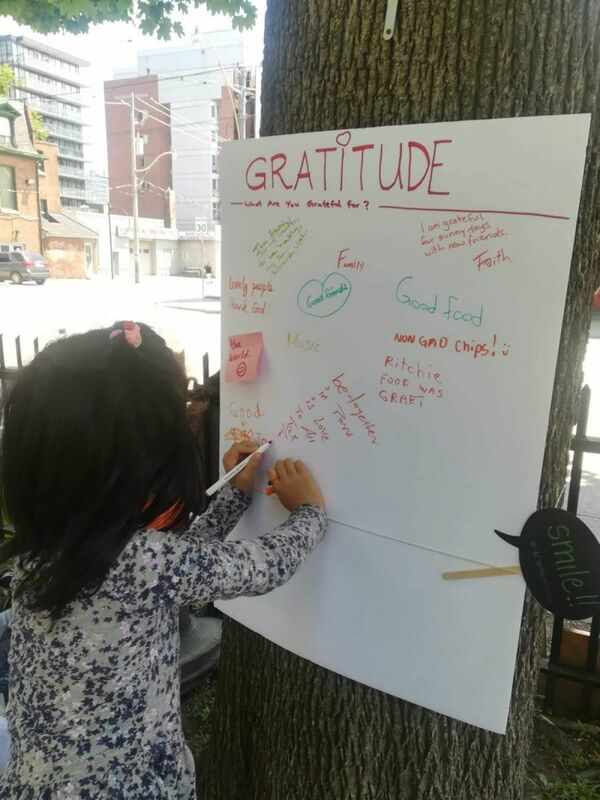 Thank you for this opportunity for Toronto to shift from transaction to trust, scarcity to abundance, consumption to contribution and isolation to community. 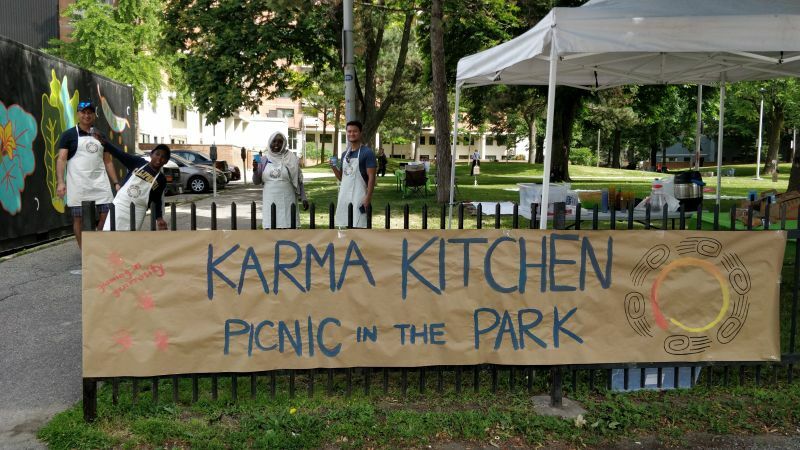 Looking forward to update you on this summer of #KarmaKitchenPicnic. Amaaaazing, Thu! :) Smiling so wide to see this! omg :) smiling sooo wide! can feel the joy all the way in dubai! thank you for this! Amazing, Thu! What a generous and energetic group of volunteers😊. A trip to Toronto must be in store☮️.